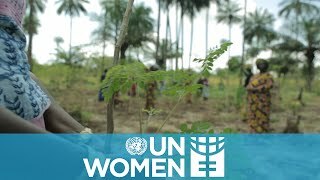 Women entrepreneurs supported by grantee Partenariat Recherche-Environnement-Médias, Guinea. Photo: UN Women/Joe Saade and Ghinwa Daher. The Fund for Gender Equality (FGE) has one guiding purpose: to support national, women-led civil society organizations in achieving women’s economic and political empowerment and the Sustainable Development Goals (SDGs). An instrument for feminist philanthropy based on principles of accessibility, trust, and women’s ownership, the Fund is a unique global grant-making model. It transforms financing from diverse donors into high-impact initiatives by women-led organizations, investing in their ideas and abilities to pursue interventions closely attuned to women and girls left furthest behind—97 per cent of its projects working with at least one category of vulnerable groups, and 70 per cent involving two or more. Since its creation in 2009, the Fund has strengthened the capacities of 131 organizations and delivered USD 65 million in grants to 121 projects in 80 countries. Projects have directly improved the lives of 570,000 people and benefitted millions more through lasting changes to public policy. To maintain the highest standards of quality and impact, the Fund constantly learns from past experiences while looking ahead and exploring new ways of working. With select grantees, it is currently experimenting with alternative grant-making approaches involving upscaling and social innovation.